Swim Cafe is fast becoming one of my favorite coffee shops. There are a lot of reasons. Most prominent, is the fact that they have a lot of great food. Pictured is a fine example. 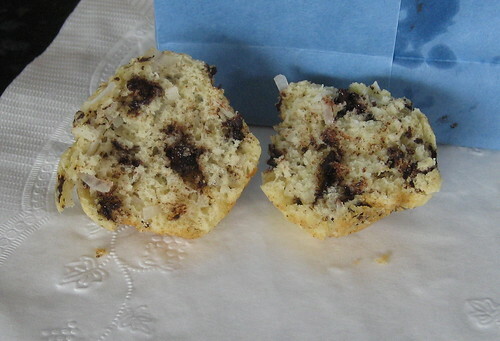 That’s the cross-section of the Swim Cafe chocolate coconut mini-muffin. I had two or three, they were highly enjoyable. My enjoyment was heightened by their warmth. Yeah, the person waiting on me just pulled a steaming panful of these out of the toaster oven behind the counter. That’s right, a toaster oven. It looked like the kind you buy at Target. You know, the kind you want so bad but your wife won’t let you have it because it looks ugly on the counter. Well, that toaster oven gets a lot better looking if you’ve tasted something as good as these mini-muffins coming out of it. This is just another example of the warm pastry rule (natural law stating that once the sensation of warm pastry is felt by the fingertips, even the most highly-disciplined human can be turned into a food-craving puddle of insatiable consumption). Swim Cafe is a great place. Not only do they cook up a bunch of good pastry, cupcakes, and muffins, they also serve up some great sandwiches, soups, salads, and breakfast. Let me personally recommend the egg, fontina, and chicken sausage panini on focaccia. Wow, it is something special. I wish I had my camera so you could see it too. Posted in food on 2007/04/14 by John.